Gemstone shapes have a lot to do with their functions. 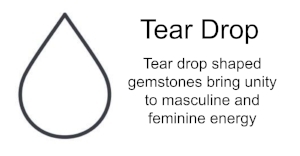 The shape and structure of a gemstone determines the way energy is received, perceived, transformed, and released. A good explain of this is the sound of your “VOICE.” We breathe in air, transform it, and release it. The sound of your voice is determined by the shape, size, and structure of your vocal cords. Gemstones and crystals filter energy through the shape and structure of their internal design, as well as their shape. For example, Crazy Lace Agate has an erratic, completely unpredictable internal pattern. 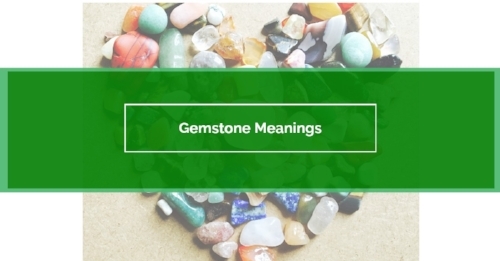 This gemstone promotes flexibility in thought and action, it stimulates fun and laughter. Crazy Lace Agate is an excellent choice when having a party or going to a social event. Now, Imagine energy being drawn into your body depending on the shape of the crystal you have on. 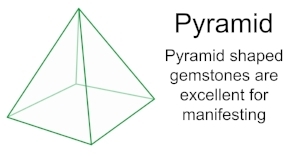 If you are wearing a triangle shape crystal, then your energy has a focal point. 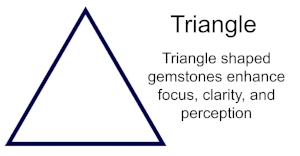 The triangle shape enhances focus, clarity, and perception. The triangle shape is just right for learning new subjects or taking a test. If your intentions are to improve your physical health, then an oval shape gemstone would be more beneficial. The oval shape absorbs energy and disperses it evenly, making it an excellent choice for healing physical ailments. Read more about gemstone shapes below. Color theory is the science of color and their meanings. This theory explains how each color creates a different physical and emotional reaction with us. What we look at reflects light in different combinations and tells our brain what color it is. This is perception. Colors communicate subliminal messages to our brian before we even realize it. For example, warm colors such as; red, yellow and orange are associated with energy and taking action. Some businesses, such as fast food restaurants, use bright warm colors so customers will finish quickly and make room for new customers to come in. Cool colors such as; green, blue, and purple are associated with peace and serenity. These colors are used in locations that require taking time, such as banks, doctor offices, and hospitals. Gemstone colors work with color theory. When choosing a gemstone, the color is very important and should be chosen accordingly. For example, if you want to attract wealth and abundance into your life, choose a green gemstone such as Green Aventurine or Jade. With these gemstones you will absorb the refreshing essence of renewal, growth, abundance, and new beginnings. If you to lift your mood, try a yellow gemstone such as Citrine or Yellow Aventurine. Yellow gemstones bring joy, happiness and enlightenment. Read about gemstone colors and their effects below. Clear Quartz is a Stone of Manifestation. Click here to learn more! Citrine is a Stone of Positivity. Click here to learn more! Align your CHAKRAS at the CHAKRA SHOP!